electro-music.com :: View topic - how do i build polyphonic sequencers? how do i build polyphonic sequencers? Posted: Mon Sep 18, 2006 4:26 am Post subject: how do i build polyphonic sequencers? am i being a total idiot? yes. can anyone post an example/link to an example of a polyphonic sequencer for the G2? i can't figure out how to build a sequencer that can trigger 2 or more notes from a single oscillator. and it's twisting my melon!!!!! did you already tried with midi send/receive modules? i don't see how that would work... let's say i want to send an A minor triad, 3 notes simultaneously... do i have to use 3 sequencers...? 3 midi send? The sequencers are monophonic in nature, they can't have different settings for each voice. You'll probably need multiple sequencers. Either straight away which means a sequencer for each note of the chord. Or more complicated like one sequencer for the base note and another to select from a set of chords. I said probably in the above as there is a way to know the voice number in a patch and with some more trickery that could probably be used to select from a set of notes, but more complicated stilland not very intuitive I'd guess. There is a need for MIDI note send modules only when the sequencer gets too complicated to fit into the patch together with the sound generating stuff. You'd need one MIDI note send per note of the chord I'd think, not really sure though, maybe a bit of trickery would work here, but I guess there would be premature note-offs then. I don't use note sends often enough. The only way that I could work out envolved using multiple sets of not just sequencers, but oscillators too! I think Jan was right about the Note Send modules being mono too. Alternatively, you can get chords using RandTrig modules with NoteQuant modules, although they'll be... random! I've just thought... you could connect the Voice No. output of the Status module to the Ctr input of the SeqCtrl module and run the control output of your NoteSeq through the control ports of the SeqCtr... you could then form your chord using the faders on the SeqCtr, although that would be the same for every note... unless you control them with another sequencer for each note using morph controls... but... what a pain! it's frustrating, because i know it must be possible to have 3 notes triggered simultaneously, if only because you are able to do it via the keyboard. but you can't send 3 different pitches as triggers to the oscillator module... or at least i can't figure out how. question is having more than one oscillator more economical than having 2 note polyphony...? Rob? Rob? where are you? Of course it is better, Once you up the poly to 2 voices, you are committing on some more DSP as well. If your mono patch with 1 osci eats up 54%, then you if you have 2 voices, this eats up an extra DSP Chip for some other osc patch. Imagine now you have your 2 oscs in one patch (the 2nd one eats up 20%) which you copy you add another and you have 3 osc patch (with 3 different midi note rec modules for independant triggering of oscs) at 94% which eats one DSP, vs adding voices (which would eat up 2 DSPs). But more of a preference, I like to use the latter approach, as each voice can be a completely different instrument, thus creating amazing layering possibilities. In fact, I just finished such a patch, it is called SectorE_DZ. This is a great topic. I enjoy little "mind bending" problems. Since the sequencer is an 8x2 sequencer, I could do up to eight steps, each step containing two independently settable voltages -- each voltage could be sent to a separate VCO for two-note polyphony. In addition, my sequencer (and most sequencers) have gate outputs at every step. Say I have three oscillators tracking from the sequencer tuned to form a minor triad. The gate signal could be attenuated to produce a half-step offset (1/12 volt) and applied to the "middle" note. Thus, the chord would change to a major triad on any step where the gate is added. For that matter -- each gate signal could be split to multiple attenuators and you could get a plethora of discreet voltages for every sequencer step. In order to get "controlled randomness" you could trigger a sample/hold from the sequencer's clock source. For the sample/hold's input, use an LFO square wave -- use random slow noise (for example) to vary the frequency of the LFO. This way, you would get one of two selected pitches that would vary at random with each clock pulse. Anyway, this may be off-topic and little help for a G2 user -- perhaps these ideas can be modified and implemented in your G2 patch. Yeah, this is a totally valid way to expand on it. That is a neat patch. Looks like you have Delay in the signal path -- is that enabling you to sound multiple notes simultaneously? The delay is for even more layering. I have 2 sound sources, some of them iteracting with each other, based on 3 tone generators. Perhaps this mp3 is not a good example. It does provide another reason why it is good to put more osc's into one voice vs use 2 voices. For diveristy. I can change the source of each voice (ie interchange the architecture on the fly). A quicxk sketch for a multi sequencer. There is also the music box or piano roll technique. I like it because it gives gate time control at the same time. recordable and storeable polyphonic sequencing. Triggering multiple notes at once from the FX area to a polyphonic patch by using MIDI modules is straightforward. What needs attention is how you can define chords in a straightforward way, e.g. program each chord separately by using several parallel sequencers, or by defining a system of major/minor/etc separately and then define the key the chord is in by transposing the chord to the wanted key. Here is some examples where one can trigger several MIDI Out modules from a limited set of notes that can be transposed to a certain key. E.g. in example 2 there are six notes chosen on the MIDI OUT modules. In the intervals of these six notes are both major and minor chords, depending on which of the six notes you trigger. I like this method as it is easy to set up possible chords and then just transpose them to the right key one way or another. In the patches I use a FlipFlop module where the Q output resets itself. This produces a Gate signal on the Q-bar output that is as long as the time interval between two triggers and goes off for only 1/24000th of a second at the start of a note. I found this a good way to expand the Gate time to layer notes to chords, without destroying the swing as set on the ClkGen module. Basically programming chords seems all a matter of reducing redundancy. What I often do myself is to see if I can see some system in the chords in a song and then try to minimize redundancy. I guess there are enough examples in this thread now and in other threads to show that there are several ways to go about and it is just a matter of what sort of approach fits your application best. thanks to everyone for answering this question. there are so many neat [sic] ideas here that i'm looking forward to trying out. I"m curious- why did you use the 8-input Mux over an 8 input Mixer? I've connected both, using a switch to toggle between the tow, and there is a noticeable difference. Because the mux selects and the mixer mixes. The idea is to select a different sequencer for each voice. So in voice 1 the topmost sequencer is active, in voice 2 the 2nd, etc. A mixer just mixes the sequences for all voices the same, and so it just won't work for the purpose. I've had a hunt around and cant find the answer to this problem. I've seen examples like using the Status module to achieve individual detuned voices and I know you can get polyphony from the G2. The problem is when using say the Note Sequencer each new pitch cuts the last one off and each new trigger restarts the Envelope. To stop each successive note in the sequencer knocking the pitch of the oscillator around after the envelope had been triggered I used a Sample and Hold. But what I'm looking to do is have one sequencer where each new voice is triggered, allowing notes to overlap. I swear one night while working on this for a while I figured it out and was ecstatic but now can't remember how I did it. I find using the attached patch if I increase the polyphony all I get is a kind of unison OSC sound with all the voices stacked monophonically. This feels so obvious but I just cant grok it. This example assumes the patch to be loaded into slot D.
example for sequencing with overlapping notes - load patch into slot D please. I'd still love to hear some other takes on the same problem. I've not really got into the bus systems of the G2 yet though I know that's where it really sets itself apart. 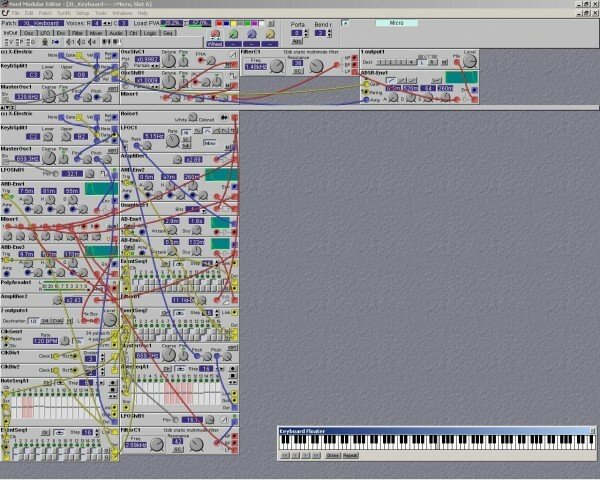 I'm wondering what kind of issues I might come up against using this method and other sequencers in the same patch. Like ones in the FX vs VA areas. I'll have to do some playing around. Use Status and 8Mux like on 3phase's patch above. Basically status module outputs which polyphony it is playing and you can use 8mux to select which sequencer module the polyphony uses. You will need 1 sequencer per polyphony of course, otherwise the notes will be unison. The patch surface you see will be layered as you rise the polyphony, Status module can tell you which 'layer' it is working. So if you have a random module based on the poly number, each 'layer' will generate different random value.